A Guide to Writing Sociology Papers insightfully lead students through the writing process, encouraging them to think sociologically as they develop their ideas and begin to write. Written in a clear and conversational style, the Guide both instructs students on the key steps of specific writing assignments—such as developing a proposal or a research paper—and also helps students get started writing, develop their ideas, and conquer writers block. Throughout, actual student papers annotated with author comments provide real-life examples of good writing and how writing can be improved. 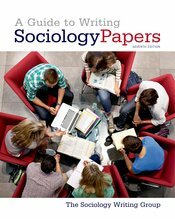 With new and expanded coverage on evaluating and citing electronic sources, plagiarism, qualitative and quantitative methods, A Guide to Writing Sociology Papers, Seventh Edition remains an essential resource for anyone writing a sociology paper.